This is the start of something really good…I can sense it. Yeah, Danette! What a great idea. You will do well, and I will be sure to pass around the website to potential buyers!! I am so proud of you for just going for it. They are so cute! I loved the picture of them hanging on the line. I definitely think you should take some shots of them on baby models (just body shots) because I loved the picture of Ellie in hers. It really shows how adorable they actually look on. All I can say is FINALLY! Now hurry up and make a million dollars so that I can get that loan! I just blogged about it and put up one of your pictures. I hope that is ok.
Danette I LOVE this! What an innovative idea and they look so picturesque hanging in the trees like that! It looks like something from an LL Bean catalog, just way cooler! Your shop is super cute too, very impressive!!! 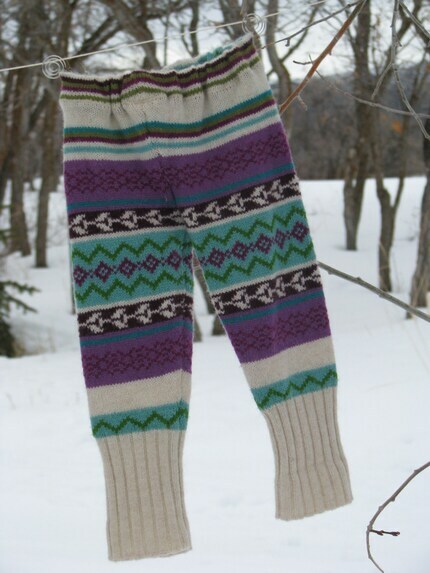 Danette, these are sooo cute, what a great way to recycle old sweaters! I wish Kai was still a toddler so he could wear these pants! That is so great too, that you are selling on Etsy… it’s one of my favorite websites! You go girl! !